Breakfast is often a little touch and go at our house. No one ever wants to eat the same thing on the same day, and they claim to dislike whatever the other one likes. I try not to get too annoyed because I get tired of breakfast food pretty quickly myself. However, I refuse to spend hours tailoring breakfasts. Check your seat kids, if you’re not sitting in plastic orange diner booths you can’t order a custom meal! Don’t get me wrong, I’m a nice Mom and I try and change up what’s available throughout the week so everybody gets something they enjoy. 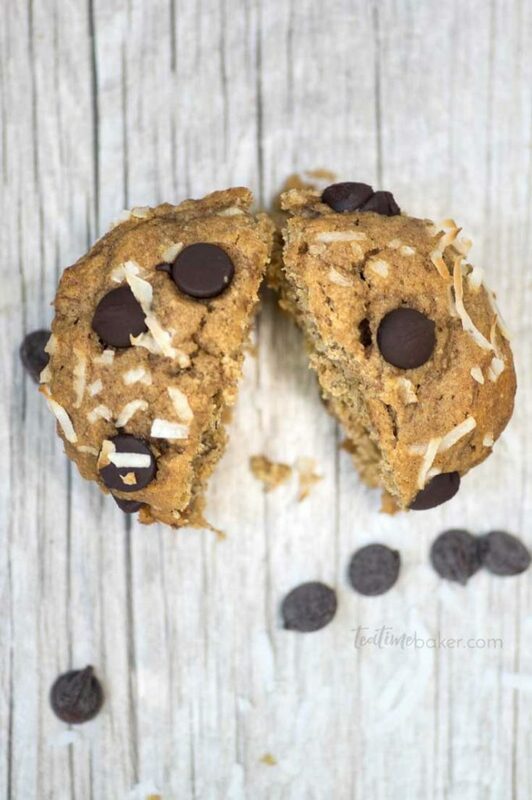 Like these delicious Caramelized Banana Bread Muffins. With these on the counter I can just whip up some eggs in the morning and boom – healthy, yummy breakfast for everyone! Perfect for breakfast, second breakfast, elevenses, dessert, snack….sorry I distracted myself. Look how pretty they are! You could mix the coconut and chocolate in but I kind of like having it on the top. 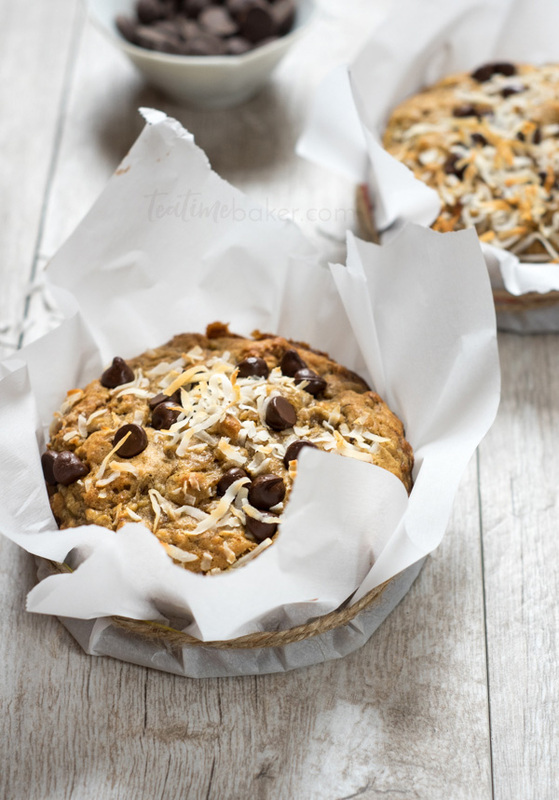 The coconut gets toasty in the oven and the chocolate is soft and sweet. Plus, this way you can make sure everyone gets chocolate in theirs. Otherwise you have to use the light colored cupcake papers so that you can check the bottom of each muffin and make sure it has plenty of chocolate chips in it before you commit. You know what I mean. This is also a great job for little hands. I put a couple little bowls of topping on the counter and let them have at it! Since these are Caramelized Banana Bread Muffins it does add an extra step at the beginning – caramelizing the bananas – but it’s soooooooo worth it! Besides, who doesn’t want to smell roasting honey cinnamon bananas first thing in the morning? The rest of the recipe is super simple, you don’t even need to use a mixer. 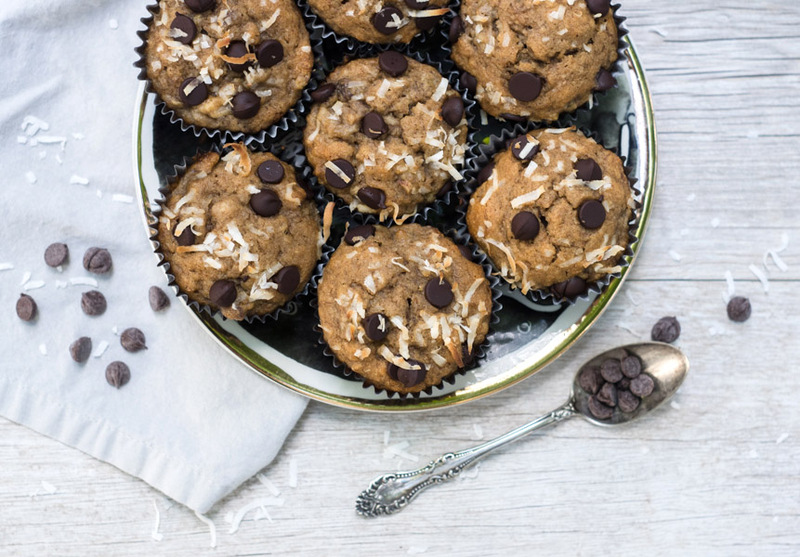 With a healthy mix of flour and a nice dose of fruit you can feel good about eating these yummy muffins. If you don’t have oat flour on hand (I live in the land of bulk food stores) just throw some old fashioned oats into the blender and voila! I adapted this from Tieghan’s Toasted Coconut and Chocolate Chunk Roasted Banana Bread recipe on Half Baked Harvest. I want to eat everything on her blog RIGHT NOW and I’m not even hungry! She has a ton of amazing recipes so you should definitely check out her site. Alternatively, if you want to get fancy for gifting as in the first picture, bake in mini springform pans. Wrap in parchment paper and tie with jute twine for an adorable gift! This is a great alternative to cookies at the holidays. 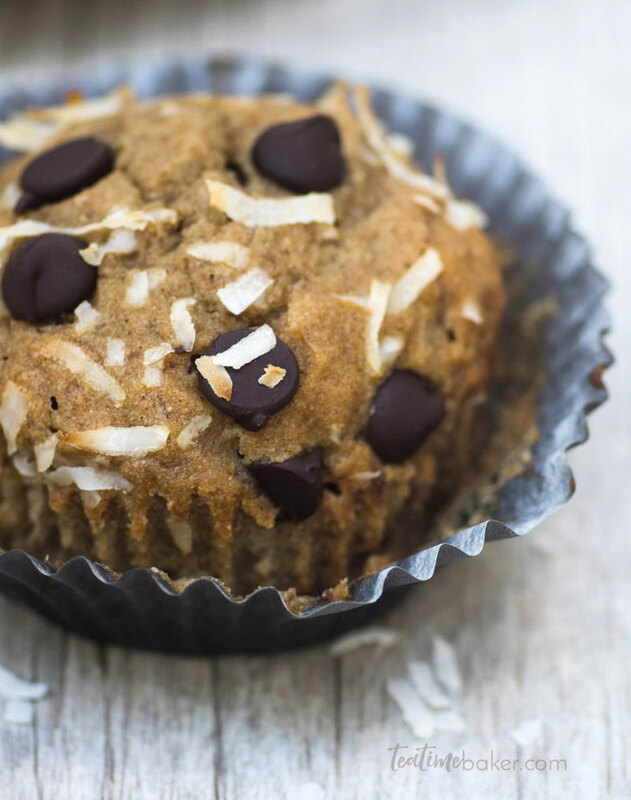 Simplify your breakfast with these easy Caramelized Banana Bread Muffins. Packed full of flavor and deliciously healthy, they are sure to become a favorite! Line a baking tray with parchment paper. Peel your bananas and lay them out on the tray. Drizzle each one with a zigzag of honey and then sprinkle with cinnamon. Bake for 20-25 mins until the tops become golden brown. Let them cool for about 5 minutes then scoop them into a bowl (I scrape the golden honey bits off the paper in as well). Once cool, mash them up. Put 12 cupcake liners into muffin pans. In a separate large bowl combine the eggs and sugar and mix until smooth. Add coconut milk and oil and mix again. Stir in the vanilla and bananas. Gently fold in your dry ingredients until just combined. This batter is moist but very thick. Put about 1/4 cup of batter into each liner and sprinkle liberally with chocolate chips and coconut flakes. Bake for 20-25 minutes until tester comes out clean. Eat warm with a cup of tea!